Industrial water treatment needs for process consumption and effluent treatment and recycle is an area that requires specific expertise and knowlegde and we at Sepcon Systems will provide the best of the same. We will tackle your water and effluent treatment needs even of the highest purity standards while you focus on your production goals. Our cross-functional team ensures thorough understanding of your requirement and offers systems and products which are the latest and most reliable technologies. You can be assured of the right support from our systems and products for the optimised and detailed engineering you carry out in your day to day production. Saving the environment is a primary goal yet equally important is the investment you need to make for this and we understand that the best. We offer various systems and products and are shown below to provide the insight into what goes into treating the effluents, click on the elements for details and for futher solutions and to understand our advantage, contact us right away. Boiler Feed Water Treatment Water intended for boilers must be as clean as possible since even low levels of contaminants may cause corrosion and cause mechanical failures. Clalrifier Sedimentation has been the mainstay process for solid-liquid separation in the wastewater industry. Ultra Filtration UF units are membrane filtration sytems eliminating any residual matter and usually prepares the water for treatment through reverse osmosis. Mixed - Bed Exchanger Demineralisation through mixed bed ion exchanger produces high purity water that can be produced for high-pressure boiler applications. EDI Electrodeionisation uses electricity, ion exchange membranes and resin to deionize water and separate dissolved ions (impurities) from water. Chemicals Chemical selection, storage, dosage rate and mixing parameters are critical parameter. Contact us for all your chemical-handling solutions. Crude Oil Separation In a typical crude oil production plant, a 3-phase separator removes water and gas from the oil. 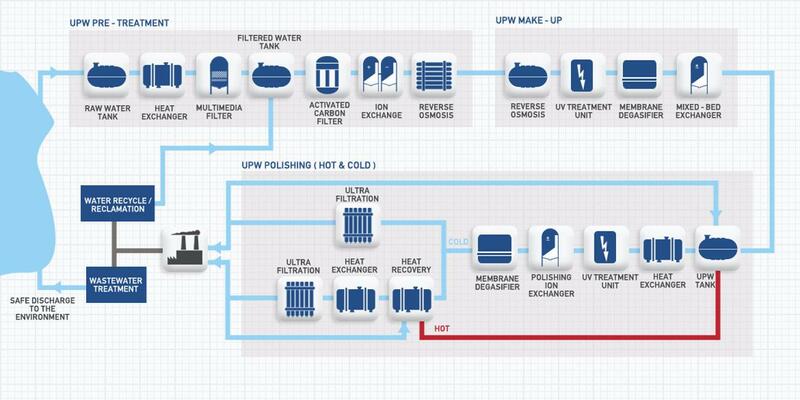 The resulting produced water undergoes a primary treatment. 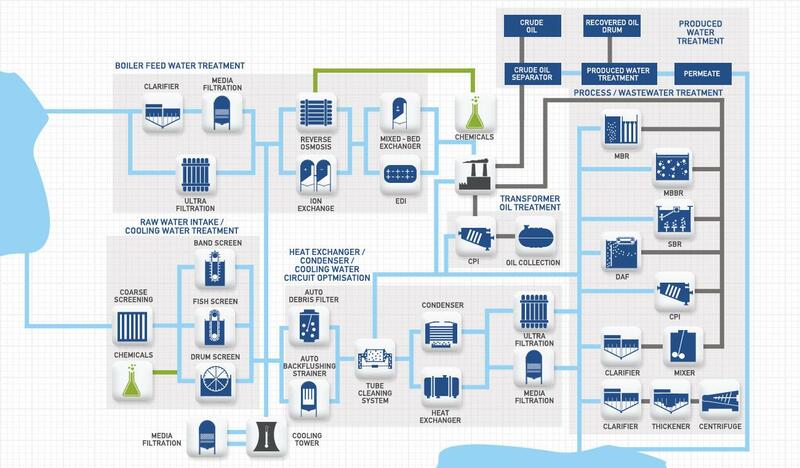 Produced Water Treatment( in blue box) Produced water with discharge requirement of free oil content tha of a typical upstream offshore installation is obtained. Produced Water Treatment Produced water intended for disposal or use as injection-water requires usually a three tier treatment. Process/Wastewater Treatment Process and wastewater must be treated to be removed of oil and suspended solids. A low footprint and ease of use is critical to industrial operations. DAF Dissolved Air Flotation (DAF) utilises fine air bubbles to float suspended solids and oils to the water's surface for removal. CPI Corrugated Plate Interceptors are ideal for the separation, removal, and recovery of bulk oil and suspended solids from process water or wastewater streams. Mixer Coagulation carried out to create conditions for particulate matter to come together to form flocs of solids with help of certain additives to furthe settle the particles. Clarifier Sedimentation is the mainstay process for liquid-solid separation. Our innovative designs perform consistently and reliably, in any given application. Reactor Clarifier We offer integrated solids contact clarifiers while combine mixing, flocculation, coagulation, settling and clarification into a single clarification/sedimentation unit. Thickener Sludge produced from treatment is thickened to increase the solids content that is to be disposed of. Dewatering After wastewater treatment, the remaining sludge contains a very high in water content that needs to be removed using sludge dewatering. Heat Exchanger/Condenser Optimisation Heat exchangers, condensers and coolant exchangers are primarily used in the power and indutrial plants for cooling & other processes that use water. Automatic Debris Filter Debris filters intercept and remove particles, fibrous matter and other solids not captured upstream, thus preventing them to enter heat exchangers or condensers. Automatic Backflushing Strainer Automatic backflushing strainers are continuous filters that capture solids from process streams. Automatic Tube Cleaning System Automatic Tube Cleaning Systems eliminate micro-fouling and scaling in heat exchanger and condenser increasing reliabilty, performance, plant output and life. Coarse Screen We offer screens that are designed to meet challenges in design of suitable municipal and industrial intake water. Band Screen In industrial applications, band screens are typical equipment relied upon to accomodate larger flows and finer screenings. Fish Handling Screen To reduce environmental impacts of water withdrawal on new/existing intakes, use of products that help return/recover fish is necessary. Drum Screen Drum screens are suitable for a variety of applications from raw sewage to ultra fine screening for water and wastewater membrane treatment systems. Media Filtration Filtration is a mechanical process that separates solids from liquid. Numerous methods can be relied upon, depending on the application and the particles size. Fresh Water maker The availability of fresh water offshore is every bit as important indsutrial processing equipment as is to provide potable water. Micron-Filtration Suspended particles and microorgansims are physically filtered out through micron-filtration. It reduces TSS levels effectively and prepares the liquod for RO treatment. Mineraliser Filter(Media Filtration) Media Filtration is a well proven & reliable technology used for the removal of finer suspended solids. Potable Water Distribution Manned platforms and channels are equipped with potable water production and distribution equipment which are engineered to suit applications even aboard ships and water vessels. Seawater Treatment Sea water is treatet and desalinated based on end use or is treated and used as an injection to increase oil recovery from reservoirs by maintaining the inside pressure, while displacing and pushing the oil towards the well. Ultra - Filtration Ultrafiltration is a membrane filtration process which has the ability to purify, separate, and concentrate target macromolecules in continuous systems by pressurizing the solution flow through special membranes. Nano - Filtration Nanofiltration is membrance filtration process which is higly effective in filtering even low TDS liquids and in removal of micro organic matter while also softening the water at the same time through the removal of cations. Heat Exchanger Heat exchangers, condensers and coolant exchangers are primarily used in the power and indutrial plants for cooling & other processes that use water. Multimedia Filter Media Filtration is a well proven & reliable technology used for the removal of finer suspended solids. Membrance Degasifier Membrane contactors specialize in O2, CO2 and N2 removal from liquids and are used for carbonation and nitrogenation. It is essential to remove excess dissolved gases to meet the highly specific production standards of pharma and electronic industries. Mixed-Bed Exchanger Demineralisation through mixed bed ion exchanger produces high purity water that can be produced for high-pressure boiler applications. UV Treatment Unit Ultra-violet sterilisation of water is an effective form of disinfection process eliminating residual microbiological contaminants. Polishing Ion Exchanger Demineralisation through bed polishing ion exchanger produces highly pure water that can be produced.